The development of tissue expansion has added another technique to the armamentarium of the head and neck surgeon for management of defects that cannot be closed primarily without undue tension. The observation that living tissues respond in dynamic fashion to mechanical forces placed upon them has been applied to the clinical problem of surgical defects; the technique of tissue expansion, based upon the application of this observation, has provided great advantages to the surgeon and patient. This technique has improved the ability of the surgeon to replace lost or surgically excised tissue with neighboring tissue of similar color, texture, sensation, and thickness. In addition, hair-bearing capability is retained, and a remote donor site is avoided. As a result of tissue expansion, the treatment of alopecia has been revolutionized, and the ability to treat other cutaneous defects of the head and neck has been greatly improved. Compression of underlying nerves, major blood vessels, and the trachea during the expansion process has not proven to be a significant problem. An image depicting tissue expansion can be seen below. Picture of scalp before removing inflated expanders. Early attempts to expand living tissues first were performed by orthopaedic surgeons in the early 1900s, but the first clinical experience with tissue expansion was not described until 1957, when Neumann related the use of a rubber balloon placed subcutaneously in the postauricular region. After gradual expansion over the course of 2 months, sufficient expanded skin was present to cover a cartilaginous reconstruction of a traumatic defect of the external ear. Unfortunately, the surgical community took little notice of this experience, even though Neumann's article appeared in a major surgical journal. The explosion in interest in tissue expansion did not occur for another 20 years. Working independently, Radovan and Austad both developed silicone tissue expanders in 1975. Radovan performed his first tissue expansion in 1976. Austad developed a self-inflating silicone prosthesis and investigated the histologic effects of tissue expansion. Since this early work by Radovan, Austad, Rose, Argenta, and others, tissue expansion has been investigated thoroughly and has gained widespread acceptance based on its proven safety and efficacy. Currently, a host of shapes and sizes of silicone expanders is available, and custom-made expanders can be manufactured when unique situations are encountered. The single self-sealing filling port may be incorporated into the body of the expander, or it may be connected to the body of the expander by silicone tubing. This remote port may be placed subcutaneously away from the body of the expander, or it may be passed externally. Permanent expanders with remote ports that can be removed in the office with the patient under local anesthesia when expansion is complete also have been developed for breast reconstruction. These ports allow injection of isotonic sodium chloride solution and removal of it if overexpansion occurs. This article primarily addresses internal tissue expansion, although external expansion is discussed in a later section. Skin expansion is more than merely stretching the skin to cover a defect; multiple changes occur in the tissues overlying the expanders during the process of expansion. New skin is generated during the process so that a net gain of tissue results. No evidence of dysplasia or other abnormal cellular architecture has been demonstrated in expanded tissues. Mitotic activity in the epidermis is increased during expansion. The epidermis thickens initially, probably because of postoperative edema, but returns to baseline within several weeks. Hair follicles demonstrate some compression but no degeneration. New follicles are not created. Individual follicles may be separated by at least a factor of 2 without producing noticeable hair thinning. Melanocyte activity increases during expansion, accounting for the hyperpigmentation of expanding tissues. This increased activity also returns to baseline following reconstruction, and the hyperpigmentation disappears. The dermis undergoes more substantial changes than the epidermis, demonstrating a rapid decrease in thickness. Activated fibroblasts are observed throughout the dermis. Overall, expanded skin has a net accumulation of collagen. Thick and compact bundles of collagen are formed and are oriented parallel to the expander surface. Collagen fibers are incapable of returning to their relaxed convoluted form once they have been stretched. Muscle tissue above or below the expander demonstrates atrophy but no alteration of function. This atrophy probably resolves following expander removal. Subcutaneous tissues display a relative paucity of adipose tissue. This loss of fat seems to be permanent. A dramatic increase in vascularity of the dermis and in the tissues surrounding the expander occurs in expanded tissues by an unknown mechanism. This observation has been compared with the technique of delaying flaps and appears to share many similarities. However, the survival length of expanded flaps is significantly greater than that of delayed flaps, which in turn is significantly greater than that of acutely raised flaps. A fibrous capsule forms around the expander, and myofibroblasts are noted on histologic examination. The expander causes a minimal inflammatory reaction. Over time, the capsule becomes less cellular and more organized, with bundles of collagen oriented parallel to the expander surface. New blood vessels also are formed adjacent to this capsule, accounting for most of the increased vascularity of expanded flaps. Tissue expansion allows for reconstruction of defects with neighboring tissue of similar color, texture, sensation, thickness, and hair-bearing capability. Donor site morbidity is avoided. This technique has widespread application in the head and neck region. The technique of tissue expansion requires multiple operations and a prolonged outpatient course. As such, the patient must have a complete understanding of the treatment plan and must agree to comply with it. Alternatives to tissue expansion, such as skin grafting, should be described thoroughly. Understanding that the temporary but significant inconvenience and cosmetic deformity of tissue expansion are necessary to achieve the cosmetically optimal final result allows most patients to accept the necessity of the inconvenience posed by this procedure. Expansion in infants and children is controversial. Possible complications include thinning and deformation of underlying bone and subsequent scar widening with growth. Tissue expansion involves at least 3 stages: insertion, expansion, and reconstruction. The ultimate success or failure of the reconstructive effort is largely based on the preoperative planning of the operative sequence, selection of appropriate expander(s), and the placement of the expander(s) at the initial operation. The natural sequence of operative events may vary depending on the clinical situation. In the simplest situation in which a defect already exists, such as a skin-grafted area of alopecia of the scalp, the procedure is relatively straightforward. At the first operation, expanders are inserted. After expansion, a second operation is performed to remove the expander and perform the reconstruction. If the defect is large and cannot be completely excised after the initial expansion, the defect is only partially excised, and the expander is deflated but left in place. After the wound has healed, expansion is initiated again. A third operation is then necessary to remove the expander and accomplish the final reconstruction. This process is termed sequential expansion. When the defect does not yet exist, as with a large nevus to be excised, several options are available. The first option is to excise the lesion and apply a temporary skin graft. 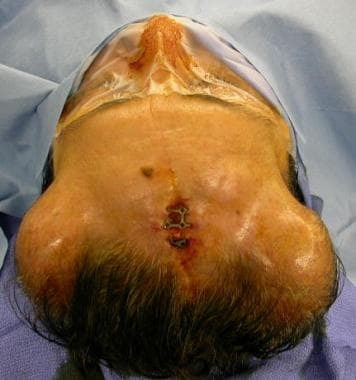 After the skin graft has healed, proceed with insertion of expanders, expansion, and reconstruction as described above in the example of alopecia. Another option is to initially place the expander adjacent to the lesion to be excised. In this scenario, the lesion to be excised coexists with the expander during the expansion process. At the second stage, the lesion is excised, and the reconstruction is performed at the same time. This may be an option for benign lesions, but it is not recommended for neoplastic processes because of the delay in removal of the neoplastic process during the expansion period. Another option when the defect has yet to be created is to excise the lesion, place the tissue expander peripherally, and apply a temporary skin graft to the defect. Once the skin graft has healed, the expansion process may begin. At a second stage, the expander is removed and reconstruction is accomplished. Again, this may be an option for benign lesions but is not recommended for neoplastic processes. Disruption of natural tissue planes for expander insertion during the same time as excision of the lesion makes reexcision less precise and more difficult if surgical margins prove to be inadequate under histologic examination. Furthermore, neoplastic cells theoretically could spread throughout the pocket created to accommodate the expander. These latter 2 strategies have been reported by some authors in an attempt to decrease the number of surgeries required to accomplish the final reconstruction. These shortcuts have increased rates of complications and should be considered as options only when the surgeon has gained considerable experience with the techniques of tissue expansion. Once a blueprint has been fashioned for the overall operative strategy and sequence, appropriate expander(s) must be chosen. One large and properly shaped expander is generally more favorable than multiple smaller expanders and is associated with fewer complications; however, some situations require multiple expanders. Multiple expanders also allow differential expansion around the region to be reconstructed. The expander should be slightly larger than the defect to be repaired. After measuring the defect, select an expander with a slightly larger base diameter. Some authors recommend expanders with a base 2.5 times the diameter of the defect to be closed, although this is not always possible within the confines of the head and neck region. The volume of the expander is relatively unimportant because expanders have been demonstrated to safely tolerate volumes considerably in excess of the volume stated by the manufacturer. Most expanders used in the head and neck region have a remotely placed filling port. Those with ports incorporated into the body of the expander may be used, but they incur the risk of implant puncture during repeated inflations. The incorporated fill ports usually are located over the center of these expanders. This skin subsequently is stretched more than skin at the periphery of the expander, making it more vulnerable to injury. Repeated trauma to the expanding skin flap through needle sticks may injure the flap and even lead to expander exposure. Once the appropriate expander is selected, the next important step is expander insertion. Perform this procedure in the operating room using standard sterile techniques. Incision selection is very important. Consider future reconstructive needs as well as regional blood supply to the region to be expanded. Place incisions so that they may be incorporated into the incisions necessary for the ultimate reconstruction and so that they are concealed along the borders of facial aesthetic units. Radial incisions are preferred by some to minimize tension on the suture lines, but these may be difficult to accomplish without creating additional scars and perhaps compromising the blood supply to the expanded flap. Radial incisions lie perpendicular to the forces of expansion. This allows inflation of the expander to begin immediately with a lower risk of wound separation. An alternative is to make a small incision at the margin of the defect, roughly parallel to the defect. This tangential incision is at increased risk for wound separation once expansion begins, and no expansion should be attempted initially. Expanders are generally placed beneath the subcutaneous tissue but above the underlying muscle; however, in the scalp and forehead, the expanders frequently are placed subgaleally beneath the frontalis or occipitalis muscles. In the neck, some authors prefer placement beneath the platysma. This extra coverage protects hair follicles in the scalp and protects against expander exposure or extrusion in the neck. Once the incision has been made and carried to the preferred depth, create a pocket to allow implant insertion. In the subgaleal plane this dissection may be performed bluntly, because very few vessels traverse this plane. However, in other areas of the head and neck, perform subcutaneous or subplatysmal placement more carefully and sharply. Not only are branches of the facial nerve possibly in jeopardy, but many small vessels traverse these planes, and they should be cauterized with bipolar current. Achieve meticulous hemostasis. Hematoma may lead to infection, scar capsule formation, and, ultimately, expander exposure or extrusion. The dissected pocket should be large enough to accommodate the expander comfortably without the edge of the expander lying within 2 cm of the suture line. This is particularly important if a tangential incision has been used. Prior to expander placement, confirm the integrity of the system by inflating the expander with air and submersing it in a basin of sterile saline. Evacuate the air from the implant, roll it up, and insert it into the dissected pocket. Inject the fill port with 50 mL of sterile isotonic sodium chloride solution, and allow the expander to unroll. Assess adequacy of the pocket. If the pocket is not large enough to allow the implant to expand comfortably, remove the implant and perform further dissection. The remote filling port should be located away from the body of the expander in a location that is easy to palpate and inject during the expansion process. Placement in a relatively anesthetic area improves patient comfort during expansion. Also consider the ease of removing the filling port during the reconstruction. The pocket developed for the filling port should be just large enough to insert the port but not tight enough to necrose the overlying skin. Pockets that are too large may allow the port to flip over and become unusable. Some authors prefer to suture the filling port to the adjacent tissues to prevent a loss of the proper orientation. Others prefer to externalize the filling port. Although this procedure has been reported with success, it places the expander at a higher risk of infection and places the filling port at risk of accidental avulsion from the expander. The tubing connecting the filling port to the expander should not be too taut. The expander and filling port rapidly become fixed in position by scar formation, and if the tubing is too taut it may rupture as the expander fills or with patient movement. Once the expander and filling port have been placed, close the wound in layers. Drains are seldom required. If a radial incision has been used to insert the expander, the expander initially may be carefully inflated with isotonic sodium chloride solution. The expander is filled until the overlying skin is stretched but still maintains good color and capillary refill and no undue tension is on the suture line. Early inflation has several advantages, including elimination of folds in the expander that may lead to implant failure or necrosis of the overlying skin. The flap length gained during dissection of the pocket is not lost to postoperative scar contracture. Hematoma and seroma formation may be decreased because of the tamponade effect of the partially filled expander. Finally, initial inflation decreases the overall time course of the expansion process. If a tangential incision has been used, waiting several weeks to allow wound healing is best prior to undertaking expansion to avoid wound dehiscence. Postoperatively, the patient should be instructed to inspect the wound at regular intervals, especially if immediate expansion has been performed. If any question exists of compromise of the overlying skin, the patient should return immediately for removal of some or all of the isotonic sodium chloride solution. Inflation of the expander generally begins 10-14 days after insertion and proceeds at weekly intervals for patient convenience. The application of eutectic mixture of local anesthetics (EMLA) cream over the fill port 1 hour or more prior to each visit improves patient comfort. A 23-gauge or smaller butterfly needle is inserted through the skin and into the fill port. It is connected to a syringe through a short piece of tubing to help prevent dislocation of the needle during each filling. Each inflation should be performed under sterile conditions, and the expander should be inflated to the point of patient discomfort or blanching of the overlying skin flap. Implant expansion should proceed until adequate soft tissue has been generated to accomplish the reconstructive goal. Measurement over the dome of the expander minus the base width of the expander provides a rough estimate of the additional tissue available for reconstruction. These are crude estimations that gain precision only through repeated experience. Some authors overfill the expander and allow the final volume to remain in the expander for several months to stabilize the expansion and counteract the tendency of the expanded flap to contract once the expander is removed. Thinning of the overlying skin flap to the point where exposure is imminent may be treated in 1 of 2 ways. The isotonic sodium chloride solution may be removed and the overlying skin allowed to retract, thicken, and heal. Alternatively, reconstruction may proceed at this point, taking advantage of whatever skin gain already has been achieved. This may not be adequate to accomplish the entire reconstruction, but partial success is better than losing the entire flap. Likewise, actual implant exposure with impending extrusion should be treated with immediate surgery, taking advantage of whatever available expanded tissue is present. In these situations, the patient may choose to undergo a second series of expansions once the wound is healed. If expansion proceeds uneventfully, reconstruction may be performed immediately. The expander may be removed through the original incision(s), or through additional incisions that may be necessary for flap rotation and/or advancement. If necessary, incisions may be made in the capsule surrounding the expander to gain additional flap length. This maneuver should be performed with caution because of the delicate network of new blood vessels present just superficial to the capsule. Any type of rotation, advancement, or transposition flap may be designed with the expanded tissue. Although advancement type of flaps require smaller incisions and result in smaller scars, they can lead to greater tension at the apex of the flap. We recommend rotation or transposition flaps in order to minimize tension at the apex of the flap, even when longer incisions are required. Because of the increased vascularity of expanded tissue, much larger flaps may be designed while maintaining adequate blood flow. However, a word of caution is necessary regarding the use of epinephrine. Evidence exists that the increased vascularity of expanded flaps may be exquisitely sensitive to the vasoconstrictive effects of epinephrine; therefore, it should be used with care and caution. Once reconstruction with expanded tissue has been completed, the wound is closed in layers. The surgeon should approximate the skin with nonabsorbable monofilament sutures, which are left in place for 2-3 weeks. This is performed in an attempt to counteract any tendency of the expanded flap to contract. Some contraction of the expanded skin flap is expected following removal of the expander. This is an important consideration, particularly when reconstructing the external ear or the nose. Providing adequate support for the flap with cartilage and/or bone grafts is important. Some authors make their flaps slightly larger than necessary to take this into account. Another important method to counteract contraction is to provide fixation of the flap to stabilize underlying tissue when appropriate (eg, fixation of the flap to the pyriform margin or infraorbital rim). External tissue expansion is another modality for increasing skin to facilitate closure of large defects. Typically, external tissue expansion is performed over a short period of time, with soft tissue creep being responsible for the gain in skin length during this procedure. The most common form of external tissue expansion utilizes tension across the defect edges to stretch the skin. Cerclage sutures can be placed intradermally along the defect edges. As the purse string sutures are tightened, the wound diameter diminishes. The wound is dressed, and after a period of 1-2 weeks, the purse string sutures are removed and the now smaller defect is closed primarily. External tissue expansion devices are simpler to apply than internal tissue expanders, and some argue that they cause fewer complications. However, internal tissue expansion can generate far greater tissue than external expansion can and, in the repair of large defects of the head and neck, remains the more reliable of the two methods. Reconstruction of scalp defects should be guided by size. Each technique has distinct advantages and disadvantages. A full discussion of each technique is beyond the scope of this article. Neumann CG. The expansion of an area of skin by progressive distention of a subcutaneous balloon. Plast Reconstr Surg. 1957. 19:124. Kludt NA, Vu H. Auricular reconstruction with prolonged tissue expansion and porous polyethylene implants. Ann Plast Surg. 2014 May. 72 Suppl 1:S14-7. [Medline]. Bauer BS, Margulis A. The Expanded Transposition Flap: Shifting Paradigms Based on Experience Gained from Two Decades of Pediatric Tissue Expansion. Plast Reconstr Surg. July 2004. 114:98-106. [Medline]. Guzey S, Alhan D, Sahin I, Aykan A, Eski M, Nisancı M. Our experiences on the reconstruction of lateral scalp burn alopecia with tissue expanders. Burns. 2015 May. 41 (3):631-7. [Medline]. O'Reilly AG, Schmitt WR, Roenigk RK, et al. Closure of scalp and forehead defects using external tissue expander. Arch Facial Plast Surg. 2012 Nov. 14(6):419-22. [Medline]. [Full Text]. Baumeister S, Follmar KE, Erdmann D, et al. Tissue expansion of free and pedicled flaps after transfer: possibilities and indications. J Reconstr Microsurg. February 2007. 23:63-8. [Medline]. Dogra BB, Sharma A, Singh M, et al. Tissue expansion: A simple technique for complex traumatic soft tissue defects. Int Surg. 2007 Jan-Feb. 92(1):37-45. [Medline]. Earnest LM, Byrne PJ. Scalp reconstruction. Facial Plast Surg Clin North Am. 2005 May. 13(2):345-53, vii. [Medline]. El-Saadi MM, Nasr MA. The effect of tissue expansion on skull bones in the paediatric age group from 2 to 7 years. J Plast Reconstr Aesthet Surg. 2008. 61(4):413-8. [Medline]. Ger R, Schessel ES. Technique for use of external tissue expansion for reconstruction of head and face defects. Dermatol Surg. 2007 Jul. 33(7):864-71. [Medline]. Hoffmann JF. Tissue expansion in the head and neck. Facial Plast Surg Clin North Am. 2005 May. 13(2):315-24, vii. [Medline]. Lasheen AE, Saad K, Raslan M. External tissue expansion in head and neck reconstruction. J Plast Reconstr Aesthet Surg. 2008 Jan 2. [Medline]. Zaal LH, van der Horst CM. Results of the early use of tissue expansion for giant congenital melanocytic naevi on the scalp and face. J Plast Reconstr Aesthet Surg. 2007 Nov 26. [Medline]. The following 8 images demonstrate reconstruction of forehead and scalp due to exposed craniotomy plates. Notice the exposed titanium plate in the upper mid forehead. Incision for placement of 2 small tissue expanders. Appearance of tissue expanders prior to placement into the scalp. Tissue expander being inserted into position. Scalp mobilization after removal of the tissue expanders. Immediate result following rotation-advancement flaps. Long-term results. Note the change in the position of a forehead nevus following tissue expansion and advancement flaps. The following case represents reconstruction of the skull and scalp following a motor vehicle accident. Patient had lost a significant amount of cranial bone and overlying scalp skin. Immediate repair of scalp was possible, but skull reconstruction required expanded scalp skin. Patient appearance prior to removal of devitalized skin and bone. Intra operative photo after removal of devitalized tissue. Postoperative CT scan prior to skull reconstruction demonstrating concave contour of the skull due to missing bone. Picture of patient following full tissue expansion. Capsular scar tissue removed from the scalp. Note the significant amount of scar tissue. Customized cranial implant being placed. Immediate results in the operating room. Long-term result showing normal convex cranial contour. Disclosure: Received honoraria from Allergan for speaking and teaching.